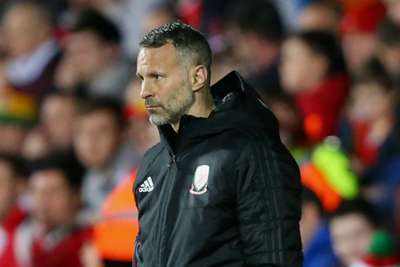 Ryan Giggs is hopeful his decision to rest key players will pay off when Wales face Slovakia in their opening Euro 2020 qualifier on Sunday. Gareth Bale, Aaron Ramsey, Ben Davies and Joe Allen were among the established names rested by Giggs on Wednesday, as Ben Woodburn's late effort secured a 1-0 friendly win over Trinidad and Tobago. Wales toiled for much of the encounter, though manager Giggs was pleased with the patience his side showed in finding the breakthrough midweek. And Giggs is confident he made the right call in giving his star names some rest ahead of Sunday's Group E meeting in Cardiff. "We've got players minutes who needed it, a lot of lads who weren't even on the bench are fresh," Giggs said. "Slovakia are playing on Thursday, and it's not a given but we wanted to use that advantage. Going into the game fresh, with a win, there's a lot to be pleased about. "I thought there was some really good stuff. We've only had a few days to work on stuff and some of it paid off. "Second half I think the lads tired, which you can understand, and credit to Trinidad and Tobago they just sat in their shape and waited to counter-attack. "But we kept going and got our reward in the end. We had our luck a little bit with Gunter clearing it off the line but I told the lads if we kept a clean sheet we'd always have a chance." "Everyone's fine," Giggs added when asked for an injury update. "We've just got to monitor Aaron [Ramsey]. Everyone's come to the camp with different levels of fitness, some have played a lot of games, Gareth's just played a 90 minutes, a lot of players needed minutes. We'll have a recovery day on Thursday and then go again Friday."